Looking to go to a flower show this year but wish you could be more certain of sunnier weather? 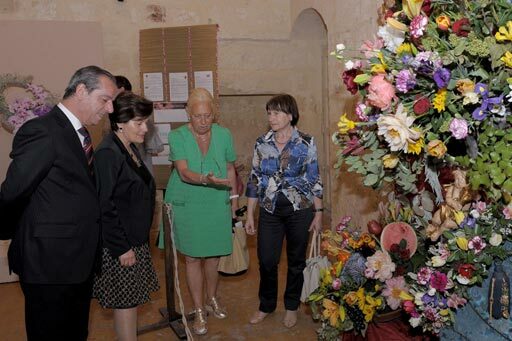 Well, you may be interested to know that the Malta Horticultural Society will be holding its annual Great Spring Show at the San Anton Palace on the island on the weekend 14 and 15 May. Chelsea Gold Medal and Best in Show winner Elizabeth Dawn Weaver will be recreating her award-winning piece for the show and will also be demonstrating at the Suncrest Hotel in Qawra on Thursday 12 May from 5pm. Aside from the floral displays and demos, the show will feature the Bonsai Culture Group and live entertainment such as the dog and jazz band of Malta police corps, the Xghajra scouts band, eight different dancing schools, the Attard village brass band, and displays on local honey, olive oil and hand crafts. The show opens for the public on Saturday from 2pm and runs until 10pm and on Sunday from 8am to 9pm. On Sunday the president of Malta, Dr George Abela, and minister George Pullicino will present the cups and trophies to the winners in the various sections and certificates to non-competition exhibits. Entry costs €2 for adults. Children under 14 go free. Sow runner and French beans and winter greenstuff. Keep sowing successional salad crops. Watch out for carrot fly - growing onions near by can deter this pest. Plant out summer cabbage and leeks. Early potatoes should be earthed up as they appear - apply a fertiliser before doing this so it can lay in the ridges whey they will grow. Watch braod beans for black fly - pinch out the soft tops whey they congregate. Crops sown earlier will require thinning out. Keep the plot free of rubbish - do not leave hiding places for slugs and snails. Should you not have one - think of window sills. Prepare to shade and avoid high temperatures. Water plants and wet floors to give humidity. Apply feed regularly, watch plants in hot spots and open vents when needed. Take cuttings of fuchsias, dahlias etc. Give plants space to develop - tomatoes will bolt if leaves touch. Bedding plants will be nearing the stage for hardening off. Cucumbers need to be on raised mounds and only watered from below. If growing in pots, then water into the saucers. The past winter was harsh and a disaster for most gardens! Many plants have been lost, leaving lots of bare patches. It is time now to sow perennials. Johnsons seeds have a range called 'Flower First Year' which should bring a late show of colour and fill the borders for next year. Spring bulbs can be fed now to build them up for next year.